So, in a random act of braveness (read: stupidity, foolishness, looniness, etc.) 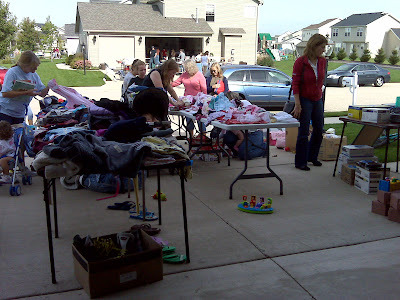 my friend Jenny and I decided to embark on the crazy road of the garage sale. 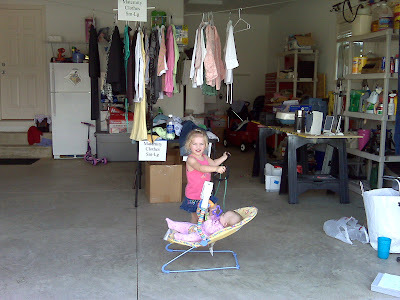 We both had some junk to get rid of and Jenny had a ton of baby clothes to sell. Jay also helped by stealing some carseats out of our neighbor's trash... and we sold one for ten bucks. 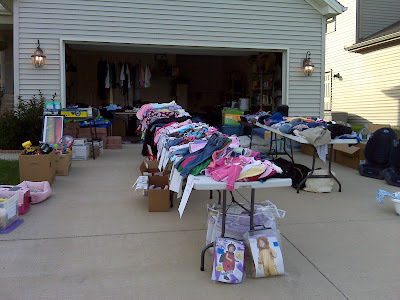 Friday and Saturday we sat in my garage and bartered with people. We really saw it all... people who wanted to pay full price, people who wanted us to throw in the house for free, everything. During the sale... we had a TON of people come by! The sale of the day (to me) was to some landscape bricks we had lined up against the garage. Jay was planning a weekend project with them but people kept looking at them, so I sold them for fifty bucks. I thought he might be mad but he said, "whew... you just saved me a weekend!" All in all, a very busy weekend! We made a few bucks and got rid of some clutter...... can't beat that! Now, off to the mountain of laundry!